SEE our Vancouver Westside Stirling on Dunbar MODEL HOME this SEPTEMBER! We are pleased to announce that the model home for Stirling on Dunbar Vancouver Westside real estate development will be opening in September 2009. Furthermore, as our pre-sale target has been reached, we will be closing our Stirling on Dunbar Vancouver presentation office until the model home is ready for viewing. What to look forward to? Vancouver Stirling homes offer three and four bedroom plans and range in size from 1,547 to a generous 2,037 square feet and feature landscaped, sunny yards and patios. A select number of Stirling Dunbar Vancouver homes also have open master suite balconies of up to 130 square feet. The new Stirling on Dunbar homes for sale feature beautiful details and intelligent planning. Overheight ceilings, custom millwork, radiant in-floor heating and a private garage are just some of the many features found in these classic Arts and Crafts style Vancouver Westside homes. Every aspect of Stirling on Dunbar townhomes is in keeping with the design concept of Westside Vancouver real estate's pre-eminent housing designers, The Airey Group. We will be in touch with an exact opening date and will be excited to show you Stirling Vancouver Westside, Dunbar's only new townhomes for sale. Regards, Ken and Mary at (604) 267-0039. September 21, 2009 Update - MODEL HOME OPENS THIS WEEKEND AT STIRLING ON DUNBAR VANCOUVER REAL ESTATE DEVELOPMENT - Saturday 26th and Sunday 27th, 1 to 5 PM. We are pleased to invite you to the opening this weekend on Saturday, September 26th and Sunday, September 27th from 1 to 5 PM of our model home for Stirling on Dunbar at 3633 West 39th Avenue Vancouver homes for sale. See what the Neighbours will be talking about here at the Stirling Vancouver homes for sale. As a registrant on our early interest list or party that has met us for a presentation appointment, you may want to see what all the talk of the neighbourhood will be. We are confident that you will be impressed by the space planning, construction quality and fine interior detailing by The Airey Group here at the Stirling on Dunbar Vancouver homes for sale. We will see you this weekend! NEW DEVELOPMENT: Vancouver West Stirling on Dunbar Homes for Sale! The only new townhomes in Dunbar Vancouver West real estate development is now upon us. At Stirling on Dunbar, these pre-construction Vancouver West homes provide amazing opportunities to purchase a family home at a fraction of the cost. Enjoy all the rewards of a single family home – abundant space, private front and back yards and direct access to your own secured garage – without the maintenance here at the pre-construction Vancouver Stirling Townhomes on Dunbar Street. Only 16 two, three and four bedroom pre-sale Vancouver West Stirline Dunbar homes are available, many of which features a one of a kind flex space so that you can either add a powder room, more storage or even your very own private elevator, it’s really up to you! The pre-sale Stirline Vancouver townhomes on Dunbar are priced from the mid $800,000 range. Register today at www.stirlingliving.ca or you can call a sales representative at 604.267.0039 today for more information. The Stirling on Dunbar Vancouver West townhomes are located at 5499 Dunbar Street at 39th. The project is designed and developed by The Airey Group and marketed by Re/Max. Being the only new townhomes in Dunbar means that you will be part of an exclusive Vancouver West real estate development that is boutique and luxurious and the first to offer optional private elevators too! Enjoy all the rewards of single family homes while living in a townhome community and all of this in a neighbourhood you want, in the classic Arts and Crafts style you love. The Stirling on Dunbar townhouses are brough to you by a boutique developer called The Airey Group – in 1986 Howard Airey founded Formwerks to design custom homes, later expanding into specialized development projects. Today, The Airey Group evolves that vision, designing and developing both private residences and benchmark multi-family homes like The Vancouver Stirling Townhomes on Dunbar in addition to commercial properties. The Airey Group is recognized for its design integrity. The Airey name represents authentic design. We are excited to release the plans and features for Stirling Vancouver real estate development – the only new townhomes in Dunbar. You will be pleased to see the range of sizes from 1,547 to a generous 2,037 square feet here at the Dunbar Stirling Vancouver West townhomes for sale. Each of the floorplans incorporate outdoor spaces with yards and patios, and a select number of units include balconies of up to 130 square feet. Pre-construction Vancouver homes at Stirling townhomes on Dunbar have up to four bedrooms and three and a half baths. Options, options and OPTIONS! Everyone likes choice. And since many of the pre-sale Vancouver West homes at Stirling on Dunbar townhomes feature a one-of-a-kind, customizable flex space, you can make the choice that is right for you. The option to have your own personal elevator, allowing access from the parking level to your living and bedroom levels, is certainly a first for Vancouver real estate development. If space is a greater priority, perhaps an extra bathroom, pantry, den or storage space would be more desirable here at the Dunbar Stirling Vancouver townhomes for sale. Another area of choice is one of two interior colour palettes conceived by interior designer Tanya Schoenroth. Beauty is in the Details: Still to be discovered are the beautiful details and intelligent planning found in each new Vancouver West home for sale at Stirling on Dunbar. Overheight ceilings, custom millwork, radiant in-floor heating and a private garage are just some of the many features found in these classic Arts and Crafts style luxury Vancouver homes. Every aspect of Dunbar Stirling Townhomes Vancouver real estate development is in keeping with the design concept of Vancouver's pre-eminent housing designers, The Airey Group. As there are only 16 pre-construction Vancouver West homes available, we encourage you to take advantage of the pre-purchase opportunity we are offering – just once – at the end of May. We will have a complete digital rendering of the interiors and exteriors for Stirling on Dunbar townhouses along with architectural plans, a 3-D model, colour and sample boards and your own personal sales consultant to answer any and all questions you may have. We will be contacting you on Monday, May 25th to book your own private presentation appointment at the offices of The Airey Group for advanced previewing of the pre-sale Stirling on Dunbar Vancouver West property development. At this time you will be able to purchase a Stirling on Dunbar home at preliminary pricing, which starts in the mid $800,000 range. Occupancy is estimated to be in early 2010. In the meantime, feel free to contact us by email or telephone with any questions. Regards, Ken and Mary at info@stirlingliving.ca or 604.267.0039. Some of the beautiful details featured at the Vancouver West real estate development called Stirling on Dunbar include: classic English Arts and Crafts architecture, gas fireplace with polished quartz surround, raised panel doors with satin nickel single lever door handles, nylon loop low emission carpeting, engineered hardwood plank flooring, custom window, door and floor moulding and millwork in addition to overheight ceilings with deep crown mouldings. These luxury Vancouver Stirling townhomes on Dunbar also have French door access to back gardens and roof top decks in most townhouse units. There is a direct access private underground garage with single or double car parking, flex space on three levels Amana front loading washer and dryer in addition to pre-wiring for security alarm system and the standard 2-5-10 home warranty. The pre-construction Vancouver Stirling on Dunbar townhomes also feature spacious washrooms with separate showers, Wood Shake cabinetry in vanilla or espresso finish, quartz counters, Kohler toilet and sink, deep soaker tubs and recessed overhead pot lighting. The ensuite bath has a frameless glass shower, overhead rain shower and porcelain floor tiling. The kitchens at the prestigious luxury Vancouver Dunbar townhomes at Stirling also include Fisher & Paykel fridge/freezer, stainless steel undermount sink, Riobel polished chrome pull out spray, polished quartz countertops and shaker cabinetry in addition to a garburator, Blombert dishwasher, DCS gas range and Broan hood fan. The initial draft floor plans for the luxury Vancouver homes at Stirling on Dunbar include Plan A1 (1579 sq ft) with two bedrooms and flex room over three floors and one car garage in addition to Plan A2 (1547 sqft) with similar layout. The pre-construction Dunbar Stirling townhomes in Vancouver West real estate market also features Plan B1 (1909 sq ft) with three bedrooms plus flex room over four floors with 2 car garage and Plan B2. Floorplan C at 1859 square feet with 3 beds and flex room has 1 car garage and four levels of living space while Plans D1/D2 are 2037 – 2021 sqft with 3 bedrooms plus den and a 2 car garage at the new Stirling on Dunbar Vancouver townhomes for sale. Floor Plan E1 is 1567sqft with two bedrooms plus a den and plenty of storage and two car garage in the basement while E2 has space for one car. Lastly, the presale Vancouver West Stirling on Dunbar townhouse features Plan F at 1875sqft with 3 beds and flex space with 1 or 2 car garage, you can decide. The response to the pre-construction Vancouver West Stirling on Dunbar townhomes for sale has been exceptional. With only two weeks of exposure within the community and preliminary marketing efforts, there has been keen interest in Stirling on Dunbar. The Only New Townhomes in Dunbar in Vancouver West real estate market! Again, we must emphasize that there are only 16 homes to choose from. Please contact us at info@stirlingliving.ca or 604.267.0039 to schedule your personal appointment with a Dunbar Stirling Vancouver West home consultant on Saturday, May 30th or Sunday, May 31st. Please note that we will be honouring the first-come, first-serve approach to maintain fairness. The Vancouver West real estate properties are priced from the mid $800,000's. Stirling Dunbar Townhomes Personal Appointments on May 30th or 31st. During your personal appointment you will learn everything you need to choose the right Stirling on Dunbar Vancouver home for you. A reservation cheque of $10,000 will be required to write a commitment agreement. Within seven days of acceptance of your commitment agreement for your pre-construction purchase of the pre-sale Vancouver homes at Stirling on Dunbar townhouses, you will be asked to increase your reservation cheque amount to a total of 15 percent of the purchase price in order to ensure Stirling on Dunbar Vancouver West real estate property is your home in early 2010. As always, feel free to contact us by email or telephone with any questions. The Dunbar real estate neighbourhood of Vancouver property is about to welcome the first new townhome community in decades and it will be located at 5499 Dunbar Street at 39th Ave. Introducing, Stirling Vancouver town houses for sale, which is a fine collection of sixteen arts and crafts Vancouver Westside townhomes for sale that are available in two to four bedroom floorplans of your choosing. Features at the Vancouver Stirling townhomes on Dunbar street include flex spaces, powder rooms, storage and even a private elevator if you so choose. All the details of a Vancouver Westside single family home, the Stirling on Dunbar townhomes for sale will have private yards, secure garaged and plenty of space to life and store things, but without the hassle of a family home. For more information about Dunbar real estate’s only opportunity to purchase a brand new Vancouver Westside home, please visit www.stirlingliving.ca or call 604.267.0039 today. The real estate developer for the Vancouver West Side Stirling on Dunbar townhomes for sale is hoping that the mix of affordability and location will attract both downsizers as well as up and comers to this most magnificent community of Vancouver West. Lcoated at Dunbar and 39th, the Vancouver Stirling townhouses have now begun pre-sales with an expected completion in February 2010. Most likely, all of these luxury sixteen Westside Vancouver Stirling on Dunbar townhomes will be pre-sold with prices from the mid-$800s, creating an affordable option for many different lifestyles and age groups. The Striling Vancouver townhomes range in size from the mid 1500s to 2000 square foot range and there are two, three and four bedroom homes for sale now. The developer is The Airey Group, well known for their attention to detail at these boutique Vancouver Westside developments. Located in a well established neighbourhood of Westside Vancouver called Dunbar, the new Stirling homesf or sale is undoubtedly a chance for growing families, couples and downsizers/retirees to attain such a prestigious address, not in a detached housing setting, but an attached townhouse community. With densification just starting, this is your ground level opportunity to own a luxury Vancouver Westside home for a fraction of the cost of a single family home, and with very little ongoing maintenance as well, suitable for today’s lifestyles. With EcoDensity principles and built green guidelines followed, there is also the magnificent option for the older folks to install a private elevator within the residences, a first in Greater Vancouver real estate development. The Stirling on Dunbar Vancouver west side homes were designed in such a way that these particular residences will allow homebuyers to age in place. The flexible floorplans here at the Stirling Vancouver Dunbar homes will include a master on the third level, but the possibility of converting a second level room into a second master bedroom as well, perfect for the aging population and homebuyer. In a way, the pre-construction Vancouver Stirling on Dunbar project is a demonstration development for Vancouver’s EcoDensity initiative, for reducing the ecological footprint by building denser and greener projects. The entire Vancouver Westside Stirling home community will consist of two parts: Dunbar Street will host the higher three level townhomes for sale while the 39th Avenue side will house a duplex and fourplex. With a turn of the century historic architecture and exterior finishing and with a landscaped courtyard, the masterplanned community here at the Westside Vancouver Stirling on Dunbar homes will be absolutely stunning once complete. If you are looking to purchase a brand new Greater Vancouver condo for sale and to take advantage of the low interest rates and reduced cost of home ownership, the Bosa Properties Silver Lining Sale may be of interest to you. Introducing pre-sale reductions on all brand new White Rock Miramar Village condos as well as the Westwood Plateau Edgemont and Claremont condominiums in Coquitlam real estate market, the Bosa Silver Lining Sale is now happening! Thre outstanding communities have launched the final sales for unsold condo inventory, and with a wide array of floor plans and layouts to choose from, the Bosa Silver Lining Sale will not disappoint any homebuyer whether you are a first time home purchaser or a downsizer. According to the VP of sales and marketing, Daryl of Bosa Properties, “We’ve rolled prices for all three communities back to levels you haven’t seen in five years or more. Becahse we have the ability to negotiate some extremely powerful payment options, homebuyers can take advantage of our unparalleled mortgage package that gives them monthly payments equal to just one per cent interest for the next three years. Even in today’s market, a one per cent mortgage is unheard of.” With Bosa Properties strong reputation for craftsmanship, attention to detail and interior finishing, the Bosa Silver Lining Sale for Miramar Village Surrey and Westwood Plateau Coquitlam condos represents the best value for new homes out there on the Greater Vancouver real estate marketplace. Within the revitalized White Rock real estate city centre lies one of the most prestigious and sought after condo properties at Miramar Village. The Bosa Silver Lining Sale 2009 introduces basement bargain pricing and the lowest mortgage rates available on the market for your new purchase of a brand new Miramar Village condo for sale. With cosmo urban living at its best, the interior finishings are impeccable while the features are endless. The Bosa Properties Silver Lining Sale 2009 at Miramar Village White Rock condos presents homes with amazing kitchens fit for gourmet chefs that include an espresso maker, high end cabinetry and counter tops in addition to zen like bathrooms with deep soaker tubs, massaging shower heads and separate showers. Also available at the Bosa Miramar Village Silver Lining Sale are units with spacious balconies and outdoor spaces that you can enjoy year round in the temperate climate of White Rock. Lastly, home buyers at the Silver Lining Sale Miramar Village condos can have unobstructed views of Semiahmoo Bay as well. The display sales centre for the Bosa Silver Lining Sale at Miramar Village is located at 402 – 1473 Johnston Road. More details about the White Rock Miramar Village waterfront condos is located here. Located between the Westwood Plateau and downtown Coquitlam real estate market lies some of the untouched natural parks and beautiful Claremont and Edgemont condominium buildings. Part of Westwood Village Coquitlam real estate development, these pre-sale Bosa Silver Lining Sale condominiums are now being featured at basement bargain pricing. And with Bosa Properties offering down to one per cent financing rates, the time is now to purchase your Bosa Westwood Village condo for sale. Luxurious and maintenance free lifestyles can now be yours with homebuyers who can expect a truly urban community close to shopping, dining, conveniences and local recreational options. The unprecedented Westwood Village Coquitlam condos for sale through the Bosa Silver Lining Sale are not going to last long, so check them out today for the best savings on your brand new home. The Claremont condos and Edgemont Westwood Village condominiums for sale through the Silver Lining Sale by Bosa Properties is located at 1503 – 1185 The High Street in Coquitlam. For more information about Westwood Village Coquitlam condos for sale, please click here. The newest update for the Silver Lining Sale for BOSA Properties is that you can now get significant savings as well as one per cent financing on your new purchase! Since the launch of this unprecedented event by this well established and world renowned developer, the BOSA Properties Silver Lining Sale has resulted in forty two purchases in three outstanding real estate developments that include the Coquitlam Edgemont and Claremont condo highrise tower residences in addition to the luxury White Rock Miramar Village resort style condominium homes. With unparalleled low mortgage interest rates and a drop in the asking price, BOSA Silver Lining Sale has been a huge hit thus far and it is continuing until all unsold condo inventor is snatched up by smart Vancouver home buyers. With quality construction, new homes and detailed craftsmanship, the BOSA Silver Lining Sale presents condo finishes that may include soft close drawers, zen like bathrooms, large floor plans, thoughtful spaces and great locations. Check out Esprit Burnaby condo’s new sales office located at the south condominium tower at 2005 – 7328 Arcola Street in Burnaby real estate’s popular HighGate neighbourhood. Better yet, for a limited time, Esprit Burnaby HighGate homes are part of Bosa’s Silver Lining Sale – an outstandin purchase opportunity for one of the few select new homes remaining at an outstanding price point. Open daily noon to 6:00pm. More information about the HighGate Burnaby Espirt condos is at their website at espritliving.ca or call 604.540.2672. SFU Altaire Condo Discounts for Students, Alumni, Faculty and Simon Fraser University Staff at UniverCity! An exclusive SFU Discount at the Burnaby Altaire condominiums is now happening and is valid for all Simon Fraser University students, staff, alumni and faculty right now! You’ve earned your place! As a student, faculty or staff member of Simon Fraser University, you are now eligible to receive Polygon’s exclusive SFU Altaire Homebuyer’s Discount that provides savings of up to $70,000 on the purchase of one of the remaining condominium homes at the Burnaby Altaire Condos. Lcoated in Simon Fraser University’s award winning UniverCity SFU neighbourhood, Altaire SFU discounts is a luxury collection of view apartment residences available for immediate occupancy (they are now complete so no waits for pre-construction condos to finish). With just nine SFU Altaire UniverCity condos remaining, this exclusive SFU Homebuyer’s Discount is exclusive only to staff, faculty, alumni and students. Now’s the time to make your move to living at the top of UniverCity SFU Altaire Condos. Proof of employment or of current or past enrolment at SFU will be required at the time of purchase. The remaining new Altaire UniverCity SFU condos that provide this SFU Homebuyer’s Discount include tow bedroom suites facing east or west and between 877 to 1043 square feet in size. The SFU UniverCity discount ranges between $50,000 to $70,000 depending on suite and the exclusive UniverCity SFU Altaire pricing is between $339,900 and $529,900. Located at 9222 University Crescent, Burnaby SFU real estate development, the sales centre is now open Saturday through Thursday from noon to 6pm. Call 604.298.1182 for more information about the SFU UniverCity Altaire Discount Program or contact Polygon Homes for more details. According to the Suite Talk in Vancouver MetroNews, the Simon Fraser University real estate development at UniverCity is providing steep discounts to SFU students, staff, alumni and faculty on newly completed luxury Altaire condo residences. Examples of the SFU UniverCity discounted pricing at Altaire Burnaby condominiums include a 877 square foot two bedroom suite originally priced at $389,900 that is now listed at $339,900 in addition to a 1043 square foot spacious two bedroom home originally priced at $539,900 that is now $469,900. According to the article, student discounts on real estate purchases never get better then this! A major BC developer is offering anywhere from fifty to seventy thousand dollars off the final nine new Altaire UniverCity SFU suites available in the Simon Fraser University masterplanned condo community. Alumni, faculty and staff are also being offered the deal to Altaire, a Polygon Homes Burnaby real estate development which will make traveling to and from school or work even quicker than ever. 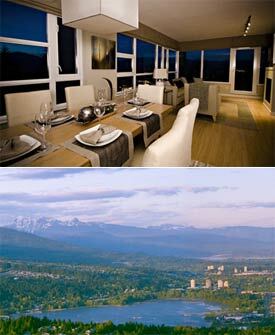 Located high atop Burnaby Mountain, the UniverCity Altaire condos overlook the Lower Mainland with spectacular views and is within walking distance to numerous shops, services and restaurants within the UniverCity Highlands Village at SFU. The SFU UniverCity Altaire Discount Progam is the first of its kind for students in the Lower Mainland property market and the Altaire Burnaby condos was designed by well known architect, Nigel Baldwin. The high rise tower residences is concrete and glass and features two bedroom condominiums that have high ceilngs, expansive floor to ceiling windows, oversized balconies and panoramic views from the North Shore Mountains to Mount Baker and beyond on clear days. IN addition, these SFU condo discounts at the master planned UniverCity Altaire Burnaby development will feature a landscaped terrace with fire pit, on site fitness gym and is only ten kilometres away from downtown Vancouver via SkyTrain. More information about the UniverCity SFU Altaire Burnaby condos for sale. One more reason why it pays to go to school is evident here at the Polygon Altaire Burnaby SFU condos. Polygon Homes recently announced exclusive discounts of $50k upwards to $70k on the remaining 10 apartment homes for Simon Fraser University or SFU students, staff, faculty and alumni. Located in SFU’s UniverCity real estate community, Altaire Burnaby condos is available for immediate occupancy right now. Outstanding views, unparalleled mountainside lifestyle and a location next to none at the UniverCity SFU community is what is being offerd. Located at 9222 University Crescent on the SFU campus at Burnaby Mountain, you can get more information about the special incentives at the pre-sale Altaire Burnaby condos today at www.polyhomes.com or calling 604.298.1182.